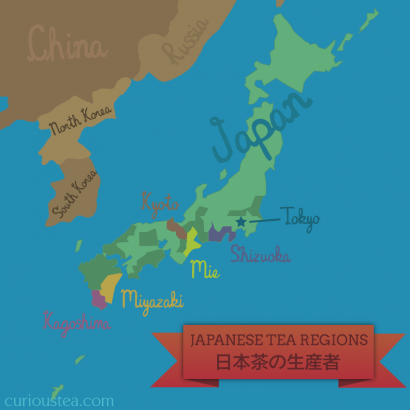 Welcome to the April 2019 edition of the Curious Tea subscription! Here’s a closer look at the four exciting new teas that we are sharing with our subscribers this month. The first light tea this month is a Moc Chau Green Heart Oolong from Vietnam that is lightly oxidised and has a wonderfully floral character. 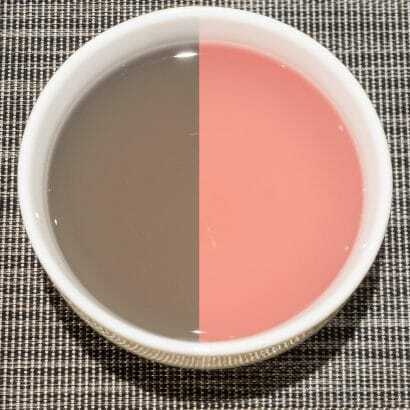 The second light tea is an unusual colour-changing Sun Rouge green tea from Tokunoshima in Japan that is made from a special purple leaf cultivar. For the dark side of the selection we have another oolong from Veitnam, a more oxidised and heavily roasted Moc Chau Dragon Breath. Finally, the last tea we are featuring this month is a Spring Regalia Darjeeling from Rohini Tea Estate, a high grade Darjeeling with a wonderful First Flush character. Mixed: Moc Chau Green Heart Oolong and Moc Chau Dragon Breath Oolong. Moc Chau Green Heart Oolong is a lightly oxidised oolong tea that is grown in the north of Vietnam, in Mộc Châu district of Sơn La Province. It is grown at a high altitude of around 1,100m on a small tea estate that specialises in growing Taiwanese tea cultivars. 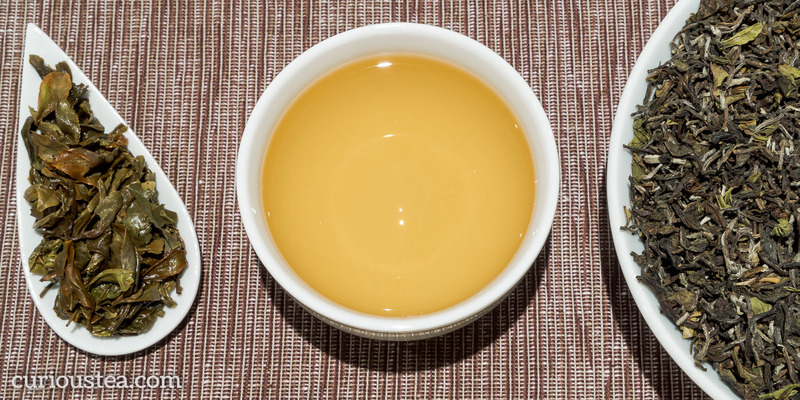 This oolong can be classed as a ‘green’ oolong as it undergoes minimal oxidation. This results in a lightly flavoured cup with brightly floral and verdant flavours. April 2018 harvest. This Green Heart Oolong is hand processed from estate-grown tea trees. The cultivar used is called Thanh Tam locally. It is the same as the Qing Xin ‘Green Heart’ (青心) cultivar, originally brought over from Taiwan. Both Vietnam and Thailand have successful plantations utilising some well-known Taiwanese tea plant cultivars, often with the aim of imitating Taiwanese oolong tea. Most of these are exported to Taiwan or Japan. However some gardens produce some very fine teas that have a unique character of their own. The Qing Xin cultivar is particularly known for the floral aspects of teas that are made from it. Unlike our heavily oxidised Red Buffalo Oolong and heavily roasted Dragon Breath Oolong, this tea does not undergo much oxidation at all. This means that this light oolong has a particularly floral character that is finely balanced by the greener verdant notes. It can be easily compared in style to some of the lightly oxidised floral oolongs of Taiwan. This Moc Chau Green Heart oolong has green leaves that are tightly rolled, which is a typical appearance for a tea of this type. When brewed, the tightly rolled leaves unfurl producing a light yellow-green liquor that has a clear and bright appearance and a lovely floral and lightly vegetal aroma. The delicate character is not overpowering, with soft, clean and light flavours. The floral notes are nicely complimented by vegetal and creamy notes of buttered asparagus. The aftertaste has a herbaceous, sweet edge and is very smooth and clean. 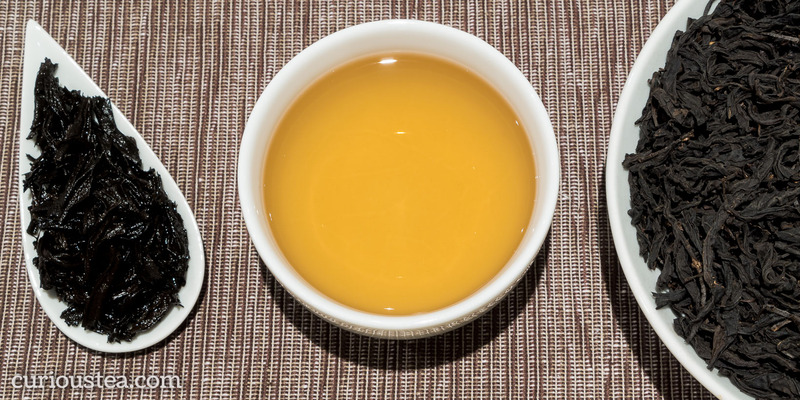 Overall this is a pleasantly refreshing floral oolong that is bound to find broad appeal. We suggest brewing at 90°C for 3-4 minutes according to your taste. It can be brewed 3+ times depending on your brewing method and taste preferences. You can also buy Moc Chau Green Heart Oolong tea in our online shop. Tokunoshima Sun Rouge is an unusual new type of green tea from Japan. Created from a new ‘Sun Rouge’ purple leaf cultivar, this tea is known for high anthocyanin content and a unique colour-changing liquor! This Sun Rouge tea comes from a plantation on Tokunishima Island (Kagoshima Prefecture) that does not utilise any pesticides. We currently have the May 2018 (Second Flush) harvest. Tokunoshima Sun Rouge gets its name from the Island of Tokunishima where this tea is grown. The island is located about 100km north of Okinawa and as such enjoys a much warmer climate than the major tea growing regions of the main Japanese islands. The sub-tropical climate combined with the volcanic soil of the island make it an ideal location for this cultivar. The Sun Rouge cultivar itself was only registered in Japan in 2009. It is the result of a 9 year development project to produce a green tea that is high in anthocyanin content. This particular tea was developed by crossing Camellia sinensis var. sinensis with Camellia sinensis var. taliensis from Yunnan Province of China. Taliensis is widely used for making different types of tea from Yunnan, such as our Da Li Cha black tea. Here the crossing of the two tea plant species resulted in a tea with particularly beneficial properties. Much like our Kenyan Tumoi Nandi Hills Purple green tea, the leaves of these tea plants are tinted reddish-purple. This is the result of the tea plants having higher amounts of anthocyanins in their leaves. This is a natural pigment that also occurs in grapes, blueberries and cranberries and also acts as protection from UV rays. These types of tea can be grown at higher altitude and closer to the equator. Purple tea can also be found naturally occurring in Yunnan Province in China where they are subject to strong sunlight and harsh growing conditions. If you would like to see what other teas of this type on offer in our shop, please check out our Purple Tea page! This Tokunoshima Sun Rouge is processed slightly differently to traditional Japanese green teas: it is pan-fried rather than steamed. 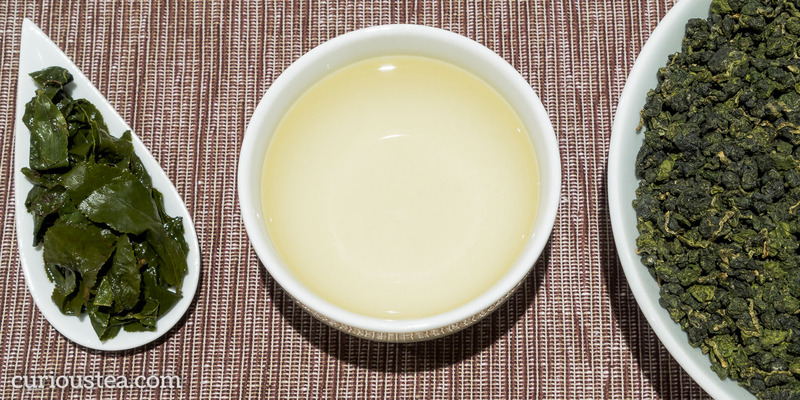 This results in a dry leaf appearance that is more similar to a pan-fried Chinese green tea. However the dry leaf does have a much darker green appearance than is typical of many other pan-fried green tea types. The colour of the liquor changes depending on the water you use and comes out in a range of colours between: bright pink – colourless – purple-grey. The colour in your cup will largely depend on the pH level of the water that you use! When using water with a high pH (less acidic), the colour will be duller and darker. Now for the fun science part of this tea! 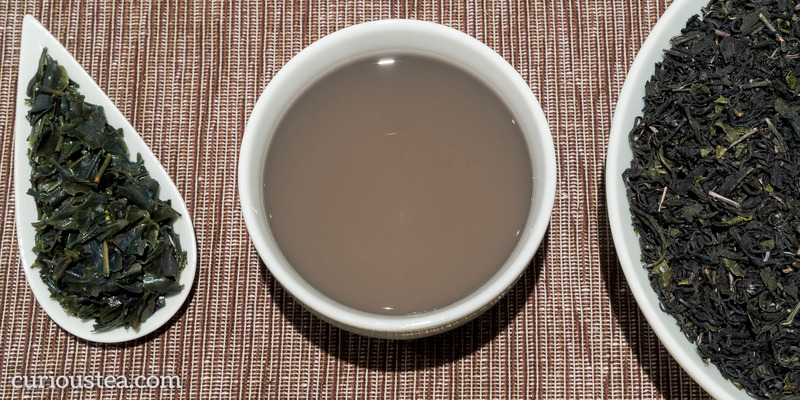 In most cases your water will have a medium to high pH level, so your tea will be either dull green or dark purple-grey. When you lower the pH level of the water used, the colour will come out lighter and more bright red or pink. Hence this tea is also often known as ‘Pink Tea’. You can do this easily by adding a few drops of lemon juice to the brewed cup. You will notice the colour change from dark purple-grey to a bright pink! This is the direct interaction between very high anthocyanin content and acidity of the water. You do not get the same interaction with other teas as they typically will have much lower anthocyanin content. Flavour-wise, this Tokunoshima Sun Rouge is also not typical of other Japanese green teas. The pan-roasting and high anthocyanin content produces a brewed cup that is most unusual. When brewed normally, the taste is verdant, peppery and grassy with pronounced savoury and umami notes and a fresh, herbaceous profile. There are further marine notes of kombu seaweed and a light astringency on the mineral aftertaste. Tokunoshima Sun Rouge is best brewed at 80°C for 2-3 minutes, with multiple infusions. Depending on brewing parameters and personal preferences the very high anthocyanin content may cause the flavour of this tea to be too astringent for some drinkers to fully enjoy this tea. In such case we recommend either enjoying it with added fruits and honey or cold-brewing this tea. The best cold-brew parameters are 10g of tea to 1l of water left in a fridge for around 8 hours, or overnight. You can also buy Tokunoshima Sun Rouge green tea in our online shop. Moc Chau Dragon Breath Oolong is a heavily roasted oolong that is grown in the north of Vietnam in Mộc Châu district of Sơn La Province. It is grown at a high altitude of around 1,100m on a small tea estate that specialises in growing Taiwanese tea cultivars. This oolong undergoes heavy roasting, resulting in a complex cup that is full of roasted flavour with lightly sweet, fruity and tangy notes. This batch was harvested and roasted in April 2018. This Dragon Breath Oolong is hand processed from estate grown tea trees. The cultivar used to produce this tea is called Thanh Tam locally. It is also commonly known as Qing Xin ‘Green Heart’ (青心) cultivar, originally brought over from Taiwan. 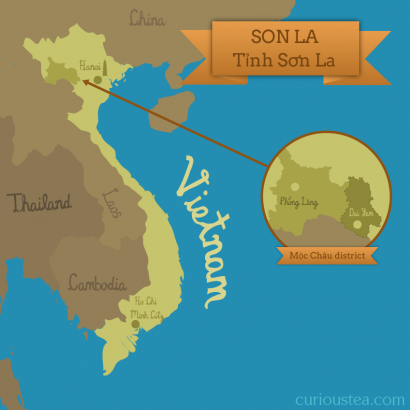 Both Vietnam and Thailand have successful plantations utilising some well-known Taiwanese tea plant cultivars, often with the aim of imitating Taiwanese oolong tea. Most of these are exported to Taiwan or Japan. However some gardens produce some very fine teas that have a unique character of their own. The Qing Xin cultivar is particularly known for the floral aspects of teas that are made from it. When undergoing heavy roasting, the floral character becomes secondary but provide a fine balance and complexity of flavours. Dragon Breath Oolong follows the same process as our popular Red Buffalo Oolong, however the leaves undergo only light rolling, resulting in a twisted bar shape similar to our Taiwanese Shui Xian Water Sprite Oolong. After the final rolling the tea undergoes a heavy roasting or baking process over 7 to 10 day period to achieve the desired flavour. The final roast level achieved is on the heavy side, 6-7 / 10. We think that this tea does benefit from a short 6-12 month rest after processing to balance out the roasted flavours. The dark leaves of this Moc Chau Dragon Breath Oolong have a twisted strip shape and are very dark in appearance with a light roasted aroma. The liquor produced has golden colour with a warm comforting roasted fragrance. The flavours are complex, with a pronounced warming, roasted profile and no astringency. At the same time these flavours are light, brisk and very smooth. The dominant roasted notes are finely balanced by fruity, sweet and tangy notes of roasted plums. The aftertaste has a tangy edge with a lightly metallic finish. The caramel and honey notes present in the tea are most evident after about 2 steepings. We suggest brewing at 90°C for 3-4 minutes according to your taste. Moc Chau Dragon Breath Oolong can be brewed 3+ times depending on your brewing method and taste preferences. The flavour tends to alter with each brew so make sure to brew the leaves multiple times to get the most out of it! You can also buy Moc Chau Dragon Breath Oolong tea in our online shop. You can also buy Darjeeling Rohini Spring Regalia black tea in our online shop. We really do hope that you enjoy the tea selection for April and are looking forward to the next selection in our May box!